I mentioned my early experience in NY with the latin bands. I thought I would re-visit that a bit 50 years later now at 68 years old on this new album. Although not Machito i am able spread my wings on that power type trumpet playing that i did way back then with the latin bands in NY. When I first got to LA the first time before my TV show I did some movie work for a wonderful creative composer George S. Clinton. I loved the way he wrote which gave me a canvas and allowed me to improvise and create a mood for the film. It doesn’t get any better than this a breath of fresh air. And how about being this relaxed with the President , First Lady and Stevie Wonder in the front row! And by the way beside being a great musician Esperanza is a really beautiful person totally down to earth as you can see. Patti Austin was great and Suzanne fitting in to all these musical situations so relaxed ! I improvised the whole show with no music different every night. Suzanne was great and could have that and only said one thing to me our whole time together “Just Do Your Glenn Thing” very unusual in the celebrity world ! I did a very successful tour with Bob Wilber for Smithsonian. It was a “History of Jazz” program starting in the 20s with Louis Armstrong and ending with Charlie Parker and Dizzy Gillespie and everything in between a very demanding 2 hour show. Bob played Charlie Parkers solo on alto beautifully and I just closed my eyes and did my own thing not Dizzy’s solo. I used to carry a Sony portable tape recorder around and throw it under my bandstand. In the 80s I did a “history of jazz” tour for the Smithsonian with Bob Wilber. I had to play every trumpet style from Louis Armstrong through Dizzy Gillespie very demanding. We were on the same touring circuit as Vladimir Horawitz and some of the audience’s never really heard jazz before. It was a huge success and this was one of the beginning pieces of the program from the 20s by the great Jelly Roll Morton. I am proud that my jazz experience covers such a wide scope of jazz the entire “golden age of jazz” from Louis Armstrong through Charlie Parker and slightly beyond with Clifford and Miles. This piece is by the great Jelly Roll Morton and is called “Black Bottom Stomp. I never learned , copied or transcribed anyones solo my whole life wouldn’t know how to do that I play jazz by ear. What I did do is try to capture the spirit and “mood” of the founding fathers of jazz with my own notes and most of all tell a story which they all could do. I met Miles Davis when I was 13 years old at Birdland in NYC. He was there with his historic sextet with John Coltrane and Cannonball Adderley. This album is half with all star small group and half orchestra ala Gil Evans concentrating on Miles work in the 50s that changed jazz. My good friend Chick Corea gave me a beautiful quote for this album which is heartwarming as he worked a lot with Miles. Etymologically, the Portuguese words bossa and bossa nova derive from a number of suggested derivations – “new trend,” “charmed” and, of course, the beach-like “fashionable wave.” The Portuguese word for genius is gênio. Of course, taking the sublime to the sublime in jazz, when the bossa nova is paired with saxophone, the result is Getz. With this lusciously performed effort, it could also be offered as Glenn, as in saxophonist, Glenn Zottola. The great jazz artist, Stan Getz and vocalist Astrud Gilberto paired in the early 1960s to bring to the United States and its listeners a unique, elegantly smooth, samba-flavored groove that was topped with marvelous melody from another gênio, Antonio Carlos “Tom” Jobim. Zottola’s The Bossa Nova Story salutes Stan Getz (and, by extension, musical co-conspirators Gilberto and Jobim), but also, it provides a spectacular display of multi-instrumentalist Glenn Zottola’s awesome talent and boundless artistry. He simply nails this Five-Star performed and delivered effort. And, for that, he can also thank his globe-trotting friend and fellow Getz fan, John Travolta, who gave Zottola the idea for this album. Unless one has been on a half-century trip to the far depths of space, the selections presented here are familiar (One Note Samba,” Meditation”). They are material drawn from what is now not only the bossa nova canon, but also, are an integral part of the jazz standards songbook (“The Girl from Ipanema,” “Gentle Rain,” “Triste”). 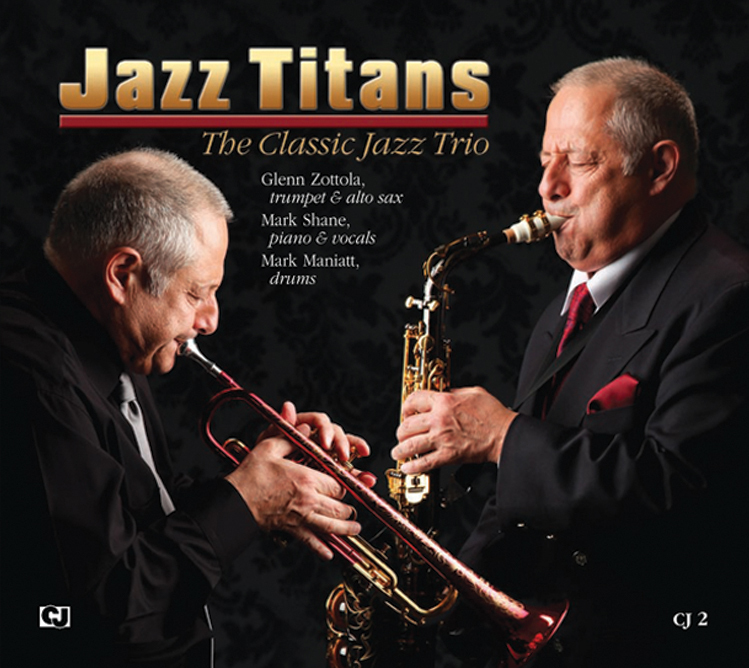 Zottola channels – but wisely does not dare imitate – Stan Getz with a lush sound that screams “I’m inviting you. Come.” Parlay that with Zottola’s axe springing a rhythmic tension to the beat that is enchanting. While part of that sound and approach is due to Zottola’s custom-made Getz-copy saxophone mouthpiece, the real reason comes from the breath, fingers, heart and samba soul of one Glenn Zottola. He is as rhythmically smooth as a wet string bikini sashaying on Rio’s Ipanema Beach – and as sultry as they come (even on the more domestically composed “Baubles, Bangles and Beads” and “I Concentrate on You”). Rest assured, The Bossa Nova Story is an elegant and equatorially warm album. It’s also very appropriate homage to both Stan Getz and the bossa nova genre itself. Copping an old Peter Allen tune, what’s “I Go to Rio” in Portuguese? Here, it’s Glenn Zottola. Picture being with a group of young 21st Century musicians – say sax and trumpet players for argument’s sake – and they’re telling you that they’re bored to the gills with their current jazz listening fare. You know, that material that’s so over-intellectualized, electri-fried, contrived and ungodly sterile that, irrespective of tempo and groove, it just doesn’t move them – and worse – it doesn’t swing for them. Then, pull out this live recording, play it for them and watch their reaction. That would be not only an instantaneous and very swinging history lesson, but also an epic enlightenment and intro to both legendary jazzer, Sidney Bechet and the world-class musicians that comprise the Bechet Legacy – Bob Wilber, Glenn Zottola and crew, including fine vocalist Pug Horton, Mrs. Wilber. Recorded live in 1991 at a series of Birch Hall concerts in England (where Wilber currently resides), this double-CD offers a hugely satisfying evening’s worth of the hottest jazz this side of the Sol. 23 – a number apropos for a very prime effort – classic selections associated with Bechet, Armstrong, Ellington and Goodman are magnificently performed with a hot-wire electricity that a studio effort can’t touch. Bechet – one of the first inhabitants of the jazz pantheon – was an inspiration, teacher and mentor to Wilber and it shows demonstratively here. Wilber’s soprano (and clarinet) sound is full and rich, Bechet-tinged, dripping with virtuosity and heat (“Oh, Lady Be Good,” “The Mooche,” “China Boy”). Unfamiliar with Bechet, Kids? You’ll hear that Bechet-soprano sound reflected in John Coltrane’s soprano work; you know, when jazz “began” with “Giant Steps.” Trumpeter Zottola is absolutely impeccable, shading the incomparable Louis Armstrong superbly. Close your eyes: he has “Pops Chops” galore with all the range, stylistic flits, shakes and blitz-attacks in the swinging book. Together he and Wilber divine the melodic and improvisational nuances of the Masters they respectfully salute. And, each tips hat while intelligently adding their own graceful and inspiring jazz commentary (“I Got It Bad and that Ain’t Good,” “Si Tu Vois Ma Mere,” “Dear Old Southland”). The stellar rhythm section consisting of pianist, Mark Shane, drummer Butch Miles, guitarist Mike Peters and bassist, Len Skeat with vocals by Pug Horton assists, complements and helps to make this Legacy certainly create its own. So, young musicians, drop the smartphones, the boring faux jazz, and get soprano-swinging smart with Sidney himself and the next best thing – The Bechet Legacy. For a man known for excesses of all kinds – musical and behavioral – Charlie Parker had the most unique way of ending his improvised phrases. Ever notice that? Some ended biting and abrupt, others were long tone vibratoed or they cascaded down a scale by way of his magnificent fingers. It was as if he was letting his genius-generated ideas fly off like bubbles from a child’s soap bubble wand here, there and everywhere. They’re for listeners to absorb and be touched. Now, listen to Glenn Zottola here on Reflections of Charlie Parker, this splendid ten tune Parker tribute. He exhibits a similar improvisational sense but that’s just one of the interesting jewels to be found on this superior recording. For those who might not be aware, Zottola is not only a talented multi-instrumentalist, playing trumpet and alto and tenor saxophones, but, he’s been a child prodigy, talent show winner, musical director, music biz entrepreneur, composer – you name it and name who he’s performed with, just see the Encyclopedia of Jazz for starters. So, it’s no surprise that Zottola, always looking for new musical vistas, would select one of jazz’s greatest artists to salute here. The Zottola alto sound is an engaging and inviting one. Sweeter than harsh, smoother than biting, it’s the perfect sonic platform for the GAS ballad material offered (“Moonlight in Vermont,” “Embraceable You”). Listen to and soak up his lyrical, gorgeous take on “In the Wee Small Hours of the Morning.” (Yes, Mother, he’s played with Frank. Can’t you tell?). Wisely, Zottola understands both Parker’s awesome technical skills and his own substantial chops (“I May Be Wrong”). Thus, on the up-tempo material here (“Oh, Lady Be Good,” “Three Little Words”) Zottola swings without attempting to imitate the inimitable (Although a keen ear will catch a slick Bird lick or two). One other point of interest that solidifies Zottola’s incredible talent: as both a trumpeter and a saxophonist, he never, not here or anywhere else I’ve heard him, plays the saxophone with a trumpeter’s mindset (and vice versa). Now that’s something that Bird, Diz and Miles would really dig. They’d dig Reflections of Charlie Parker, too! In 1981 I put together a quartet and got us a gig 5 nights a week. We did one live album and that was it I left to form the Bechet Legacy with Bob Wilber and Butch joined that band later. This is Butch singing a playing at the same time ! We tore it up ! It’s no secret among jazz musicians that, as much as they enjoy stretching out over a speedball tempoed selection, almost to a person they’d tell you that they would love to make a recording with a lush string section behind them. None less than Bird himself – Charlie Parker set a standard for all with his classic effort, Charlie Parker with Strings (Mercury Records, 1950) It produced by – of all people – that “singalong” sultan, Mitch Miller, who also played oboe on the Parker session!). Multi-instrumentalist Glenn Zottola will indeed tell you that, as much of an influence Louis Armstrong was and is on his fine trumpeting, he, Zottola, spent many a sleepless nights endlessly listening to a turntable spinning Clifford Brown with Strings (EmArcy, 1955), Brownie’s classic strings album. While Clifford blew gorgeous tones, Zottola dreamed of one day saluting a trumpet idol. 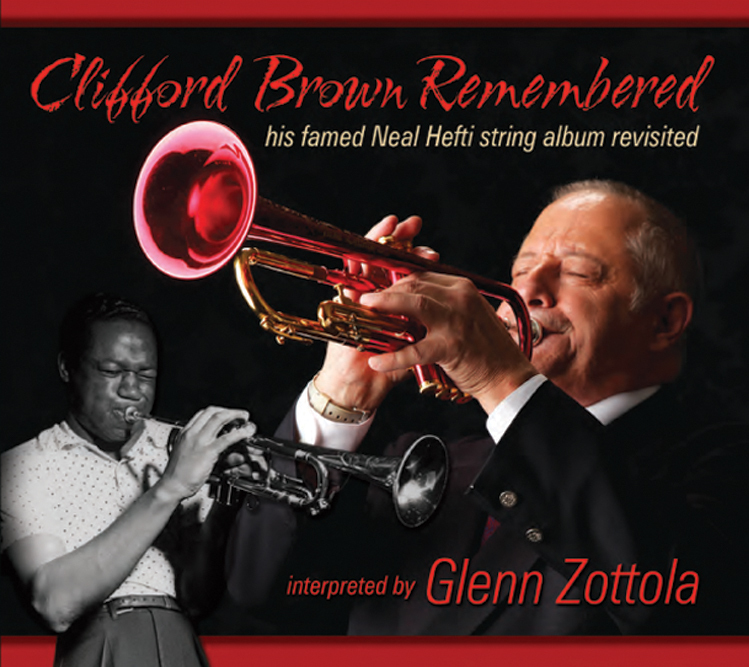 With Clifford Brown Remembered Zottola does just that – and does so brilliantly. Zottola achieves a near-impossible achievement on this sublime effort. He has, with incredible interpretive shadings – re-created the entire Brown recording nearly note-for-note without written music. And, he performed the session completely from memory! Further, the original Neal Hefti arrangements used by Brown were transcribed also note-for-note by ear by this album’s arranger. The album follows the sequence of the original recording with Zottola’s lush and highly emotionally-charged tone covering the Brown ballad takes. He simply doesn’t miss. He soars as he salutes the gone-way-too-soon Brown on a dozen Great American Songbook selections (“Laura,” “Stardust,” Willow Weep for Me”). There’s tons of emotion here as Brown’s original interpretations are further interpreted – not mimed – by another Master trumpeter. The strings and rhythm section employed here are a perfect platform for Zottola’s lyric style. With Clifford Brown Remembered Glenn Zottola distinguishes himself not only as an adoring acolyte and student of Greatness, but also as a marvelous master of the trumpet. This is a trio without bass I did in Europe for several tours patterned after Benny Goodman’s historic trio with Teddy Wilson and Gene Krupa. After working with Benny for 2 years I wanted to see what that format would be like. I left for Hollywood right after that band and the last tour was 35 concerts in 30 days !! Jubilee was a big Louie tune ! I recorded this in Europe and put it on my anthology “A Jazz Life” . Ben Webster always had a split musical personality, On uptempo tunes the great tenor saxophone could sound quite intense and had a great affinity for intensified growls, screams, and high-pitched honks capable of jolting the crowd out of sleep. This was, at times, his calling card. To electrify the crowd and even send shockwaves was part of his natural image, a code of conduct that he subscribed to diligently and faithfully. On the ballads, he morphed into a completely different personality. He had a softness about him when he began purring, often being likened to the harmless and soothing sound of a pussycat. He became enamored with his romantic side on ballads, playing with a soft and sweet touch that set the crowd’s mood. He made every sound resonate and touched the crowd in a heart-warming way, giving way to soft, kind feelings and romance. Shaped by the persuasive ways of Coleman Hawkins, Webster could not rehydrate the majestic way in which he understood and located his chords. In Ben Webster revisited, Glenn Zottola pays special devotion to honoring one of the influential legends of his time frame. He replicates the romantic, relaxed, and jubilant approach which defined Webster’s touch in his ballads. Implementing feeling and nostalgia into each note, Zottola churns out a number of songs revisiting the romantic livelihood embodied by Webster. Songs such as “Can’t Help Lovin’ That Man,” “Blue Moon,” “Laura,” “Stardust,” and a bevy of others make this item complete. Zottola doesn’t replicate or revive the style of Webster as much as he captures the true nature of Webster’s romanticism. Butch Miles is one of the greatest jazz drummers of all time and a really beautiful cat. I had not played with the great Freddie Greene before and I never forgot after my solo I heard him whisper to Milt Hinton “he reminds me of Buck” meaning Buck Clayton. Those are moments in your life that you never forget better than the Grammy’s ! This band sounds a lot bigger than it is just 4 horns 2 trumpets and 2 saxophones. Butch having played with Basie all those years adding Milt Hinton , Freddie Greene and John Bunch make this another “All American Rhythm Section”. It was January 16th 1988 same day as the original concert and I found myself at Carnegie Hall to a packed house sitting in Harry James chair playing lead trumpet and jazz for the 50th anniversary of the historic Benny Goodman 1938 concert. Anyone who was at the concert in 1938 was allowed to sit on stage with the band. Playing next to Benny in his septet for 2 years every night prior set the stage for me for this event. As i was playing I could see decades dropping off the faces of those sitting on stage as they relived the excitement of that historic night when they were in their 20s now in their 60s and 70s. We did the exact program of 1938 with the same music all brown from the Library Of Congress with notes scribbled on my parts by Harry James 21 years old at the time. If one could ever turn back time this is as close as you can get. available on iTunes, Amazon , CD Baby and innercityjazz.com on Glenn Zottola “A Jazz Life” anthology. It was January 16th 1988 same day as the original concert and I found myself at Carnegie Hall sitting in Harry James chair for the 50th anniversary of the historic Benny Goodman 1938 concert. Anyone who was at the concert in 1938 was allowed to sit on stage with the band. Played next to Benny in his septet for 2 years every night prior set the stage for me for this event. As i was playing I could see decades dropping off the faces of those sitting on stage as they relived the excitement of that historic night when they were in their 20s now in their 60s and 70s. We did the exact program of 1938 with the same music all brown from the Library Of Congress with notes scribbled on my parts by Harry James 21 years old at the time. If one could ever turn back time this is as close as you can get. This is another one from Butch Miles Basie Tribute. They asked Frank Wess , Myself and George Anders to call off 3 tunes for a ballad medley. Frank Wess called “Don’t Worry Bout Me” I called “These Foolish Things” on Alto and George Anders did “If I Had You” in which he wrote a little ending prior. What a great Rhythm section Butch Miles , Freddie Greene , Milt Hinton and John Bunch top of the line. These were some sessions and I ended up playing Trumpet , Tenor and Alto on this session ! This is my very first time ever I was recorded on tenor sax. All this nice response to my tenor album got me searching my archives. I did a tribute to Count Basie for Butch Miles 35 years ago. Great band Butch on drums , Milt Hinton , The great Freddie Green on guitar, John Bunch on piano myself and Marky Markowitz on trumpets and Frank Wess and George Anders on Tenor. I brought my tenor to the session not sure why was just starting to fool with it. Marky took the first trumpet solo and I was supposed to take the second one but got so inspired by the tenor battle with Frank Wess and George I pulled the tenor out of the case and took a solo on tenor from the trumpet section after they finished ! Amazing the producer allowed that surprise and made a note of it in the liner notes ! When I came out of retirement a few years ago what I have tried to do with these 14 releases is cover the “golden age of jazz” from 1920 Louis Armstrong to 1950 Charlie Parker a glorious 30 year period. I wanted to share all the influences that made me who I am Louis Armstrong , Lester Young, Roy Eldridge , Dizzy Gillespie , Charlie Parker and even slightly beyond into the 50s with Miles Davis , Clifford Brown , Zoot Sims and Stan Getz. This was the “renaissance” and melting pot that created this art form and i feel so privileged to have been a part of it these last 55 years. Carnegie Hall 1988 a packed house the 50th anniversary of the historic Benny Goodman 1938 concert another high point in my career. Same exact program as 1938 sitting in Harry James chair all night playing lead trumpet and jazz. The music was from the library of congress with handwritten notes on my part’s by Harry who was 21 years old at the time. Harry was enamored with Louis Armstrong and wanted take a shot at a short version of Shine a big hit for Louie. I played my own solo that night not Harry’s. Isaac Stern did the intermission and much to my surprise he was big jazz fan talked about 52nd street when he first came to NY. Benny’s daughter gave Issac Benny’s clarinet for the Carnegie Hall archives at the end of the night the first time jazz was every in Carnegie Hall. I put this track on my anthology didn’t know it was ever recorded until someone who was there gave me a tape 25 years later ! Zoot Sims , Glenn Zottola , Teddy Wilson , Milt Hinton and Gus Johnson. I was very young and all the guys were 45 years my elders but you would never know it from the intensity of the band.This was recorded by someone in the audience so the sound quality is not great but you can certainly hear the energy. I felt Like I was at “Jazz At The Philharmonic”. Zoot was one of the great swingers of all time or as Milt Hinton called him “the salt of the earth” ! What an amazing journey it has been these last few years after coming out of retirement. I have several new releases coming out in 2015 and I wanted to cover with all these albums the full scope that my musical life has been on both trumpet and saxophone . My Clifford Brown tribute was my return to trumpet after several years away from it and it has gotten so much acclaim it inspired me to spread my wings and “chops” so I did 3 more trumpet albums since that point. This album returns to some of the “Bravura” on trumpet that attracted me to the instrument when i was very young. I want to thank Irv Kratka at Classic Jazz Records for giving me the opportunity to do this. I would like to thank my dear friend and jazz legend Terry Gibbs for helping me to select this take on this song “everything happens to me”. Terry is a huge admirer of Charlie Parker’s work as I am and no better person to help me as he played with Charlie Parker and knew him. This project is very close to my heart like my earlier Clifford Brown remembered album and I want to pay homage to those greats that helped make me who I am and who I owe everything to. This was the first time any jazz artist recorded with strings which paved the way for future artists like Clifford Brown and Stan Getz. I wanted to see what it would feel like if I walked the studio on that historic day in 1949. Of course it helps to have Charlie Parker open the door and point the way. I am doing my own solos and even playing in different places than Bird just as I hear it. The project is going a little slowly due to some illness in the family of my arranger but it should pick up shortly. The sitcom “Martin” was taping right next door to us at Universal Studios. The 2 girls were coming on the show so I went to their dressing room and worked up this arrangement with them in 45 minutes and brought it to my piano player and he wrote a chart. I love doing that stuff ! Very talented girls and fun. Bob Wilber and Glenn Zottola “China Boy” at The Smithsonian. I spent several years with great soprano player Bob Wilber. We formed the Bechet Legacy band and did many albums and toured the world. We recorded this concert at the Smithsonian in DC. Bob was a great foil for me. In put China Boy on my anthology “Life In Jazz”. In the old days we used to say he who could play a ballad would own the audience. Don’t know if that is true today but I certainly love to play ballads. At 67 years old It all started with my recent Clifford Brown tribute and I realized after 10 years away from the trumpet how much I truly missed it. The trumpet was my first love and what a joy to play in these wonderful settings.